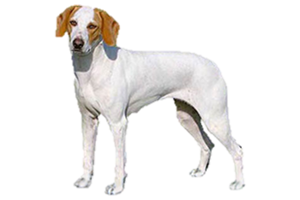 The Istrian Shorthaired Hound is a scenthound that was originally developed to hunt boar and deer in what was once Yugoslavia. In more recent times it is used to pursue fox and hare. This region is home to three scenthounds, the other two being the Istrian Wirehaired Hound and the Posavaz Hound. The Istrian Shorthaired Hound originated on the Istrian Penninsula, which is surrounded by the Adriatic Sea. This was once the northwestern corner of Yugoslavia, but today is part of both Croatia and Slovenia. Both countries have laid claim to the Istrian Shorthaired Hound and its close relative, the Istrian Wirehaired Hound. Currently, the Fédération Cynologique Internationale has granted Croatia ‘ownership’ of both breeds. It is believed the Istrian Shorthaired Hound is an ancient breed. Perhaps descended from native European hounds and sighthounds brought from the Middle East by Phoenician traders. Paintings depict dogs very similar to today’s breed dating back as far as the 1300s and written records date to the 1700s. The Istrian Shorthaired Hound was never well-known outside its homeland and war in the later part of the 20th century caused their numbers to fall drastically. For now, the bloodline appears to be stable, but still restricted to inside Croatia and Slovenia’s borders. Is the Istrian Shorthaired Hound Right for You?